The following events are subject to change without notice! The month of Valentine's Day, February is filled with events, offers, specials, and much more! In addition to Update 1.4's roll-out, we've got a chance to score a sweet Credit discount on a French Tier X light tank, a x4 XP extended weekend, and huge savings on a lovely vehicle — just to name a few happenings! This is by no means a complete schedule. Several surprises await, so make sure and check back for the latest news and information! Stay out of the doghouse: ♥ Valentine's Day is Thursday, Feb. 14! Feb. 1-Mar. 1: Premium Account "Steal-of-a-Deal"
A series of challenges that help you master light, medium, and heavy tanks along with tank destroyers! Buy Premium Account time and get a tank, Garage slot, and 100% Crew! Owning a Premium Account has several benefits, but to sweeten the deal, we're throwing in the Swedish Premium L-60 Tier II light tank, a Garage slot, and 100% Crew when you buy 30 Days! We've got rewards for completing specific objectives during February Tournament matches — please see the Tournaments forum for more info. Top Tier VII and VIII selections! We feature a different Tier VII or VIII vehicle, bundled with Premium Account time, Boosters, and other goodies. Special Gold, Credits, and Premium Account time combination bundles are also available — each sale lasts only one week, so make sure and check back each Friday for a new offer. February is all about Tier VIII! Are you an "Ace Tanker?" Get an "Ace Tanker" Mastery Badge on featured vehicles to unlock six special emblems. See the Tank Mastery Missions section for this month's lineup! We have special XP rewards each weekend, so make sure and check back Near the end of the week! Feb. 15-19: x4 XP for Everyone! Sweet deal on a currency bundle! 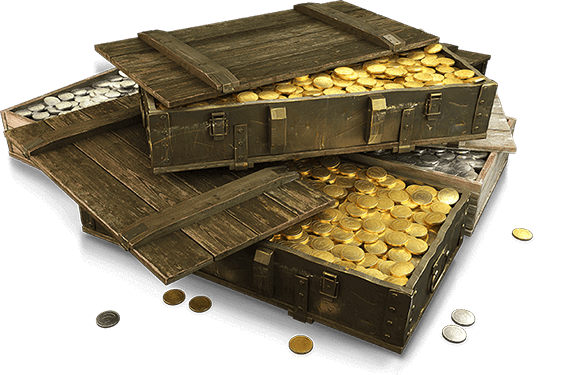 Super War Chest: A massive currency bundle of 15,000 Gold and 20 million Credits — offered with a 30% discount. Two vehicles with special deals each week! Each Thursday in February, we have a special offer on two vehicles. 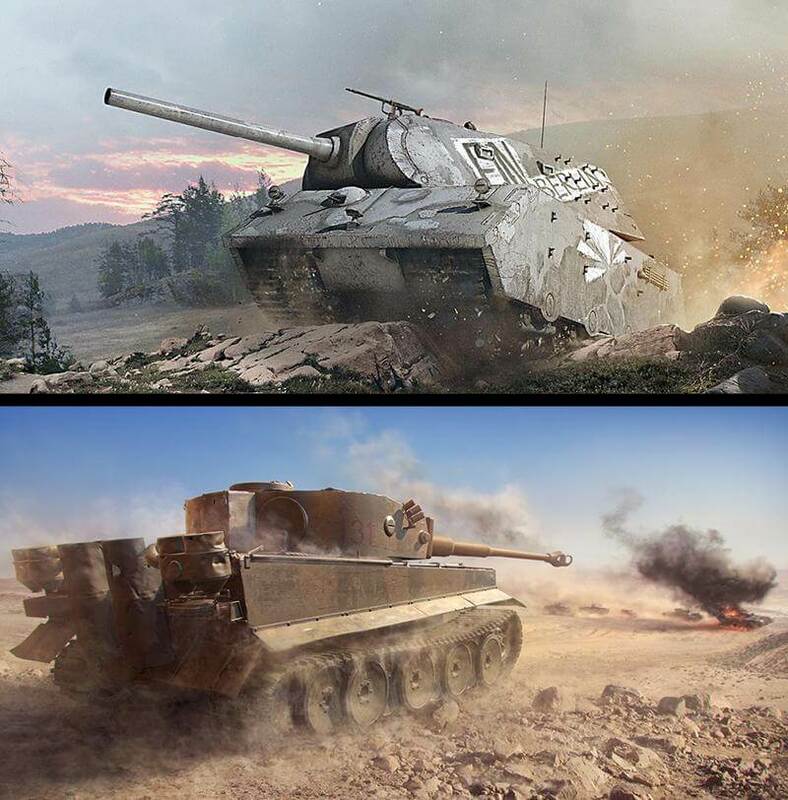 We start off the month with two German heavy tanks — a Tier VIII and VI! A special day for a special tank! An exclusive mission for the Soviet Valentine II Tier IV light tank! Don't have the vehicle? Don't fret — we're offering it for a 75% Gold discount! Need currency and Premium Account time? 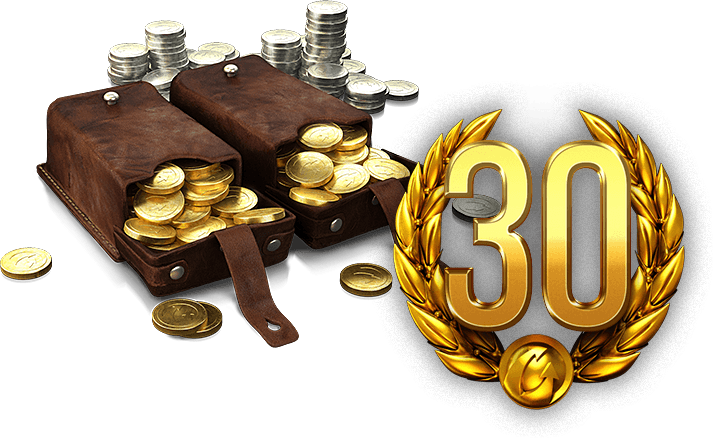 Triumvirate: A bundle of goodies: 3,000 Gold, 3 million Credits, and 30 Days Premium Account time — save 19% when you purchase during this offer period! Get a Tier X light tank! Get on the fast track to top-Tier vehicles, and earn consumables, equipment, and a Premium vehicle along the way!